If there a thread for this topic? What do you use to transport product from your auto to your machines? Looking for suggestions. Ideal cart/dolly would be collapsible (foldup), light weight and sturdy. Even better if it could hold (or lift) product to waist height to reduce bending when loading/unloading. Ideas? Nothing will lift the product to your waist height. The light weight Gemini dollys are the best to use. They are convertible from stand up dolly to a platform dolly but they won't fold up to fit in a car. They are for real vendors that are professional and don't work out of cars. Nothing that folds up will carry any real weight so you're stuck in between. About 8 years ago, i purchased a small dolly from harbor freight (i think). It is rated for about 200 lbs and weighs maybe 10 pounds. It's not capable of carrying much but it got me through the smaller accounts until i could move up to a larger vehicle and a larger dolly. I have used a convertible dolly from Sam's ($100) for the past 6 years. It's a little heavy but it gets the job done. The little one easily fit in my car though. It's still in the back lol. Thanks for your comments. I'm starting small, as I assume most did in the early days of their business. Hopefully I can provide good customer service and grow into a real vendor someday. Until then, I still have to work within the limitations of the vehicles and equipment I have. Thank you. I appreciate your input. I'm starting small but hope to grow the business. Your advice is appreciated. I use a dollie sold by Magliner that comes in 2 parts, the main platform truck and an extension. The main dollie section is also foldable and has a foot activated brake on one of the pivoting wheels. The extension is super easy and quick to attach to the dollie and just as fast to remove. 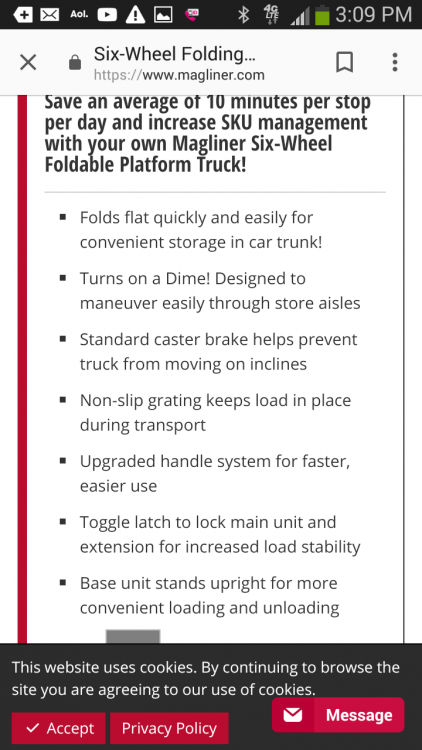 With the extension attached, the dollie has 6 wheels and maneuvers just like the blue flatbed carts at Sam's and can hold almost as much product as the Sam's flatbed. I use the extension when I have a huge load or I'll use just the dollie section on smaller loads. It's still hard to find on Magliner's website. 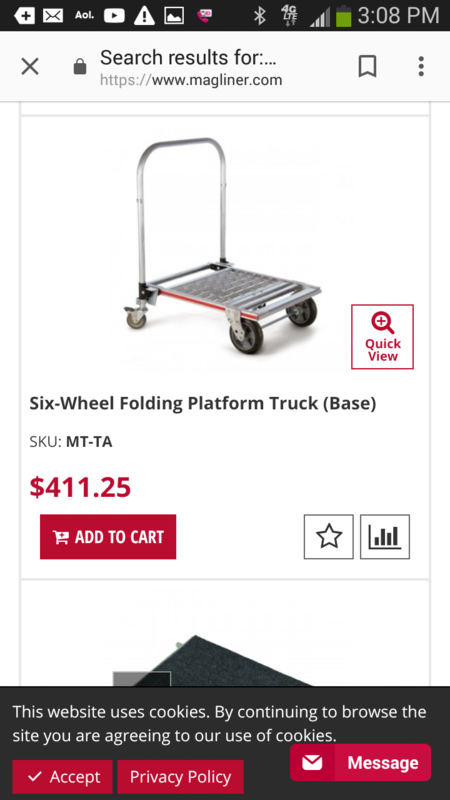 Search "convertible hand truck" on their site and a picture of it will come up and is listed as "6 wheel folding platform truck." These dollies are awesome! Good luck! It's still hard to find on Magliner's website. Search "convertible hand truc﻿k﻿" on their site and a picture of it will come up and is listed as "6 wheel folding platform truck." These dollies are awesome! Good luck! Thanks for the tip. 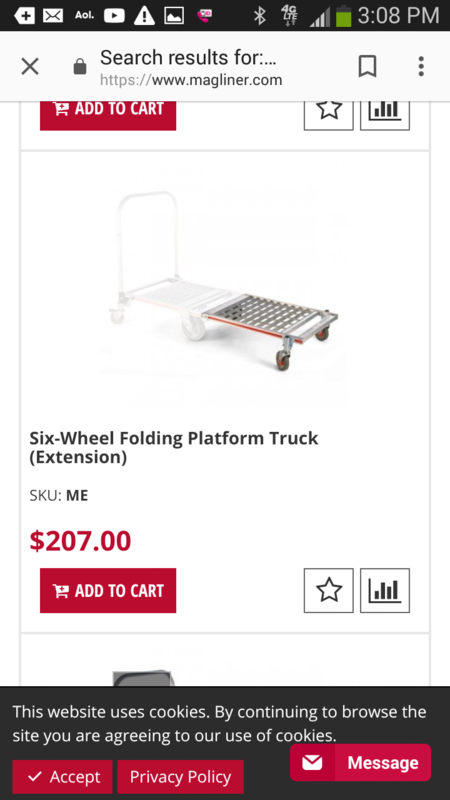 I'm not sure I found the cart you described, but there are several good options on Magliner. The 6 wheel hand truck you described is a bit elusive; not sure why. 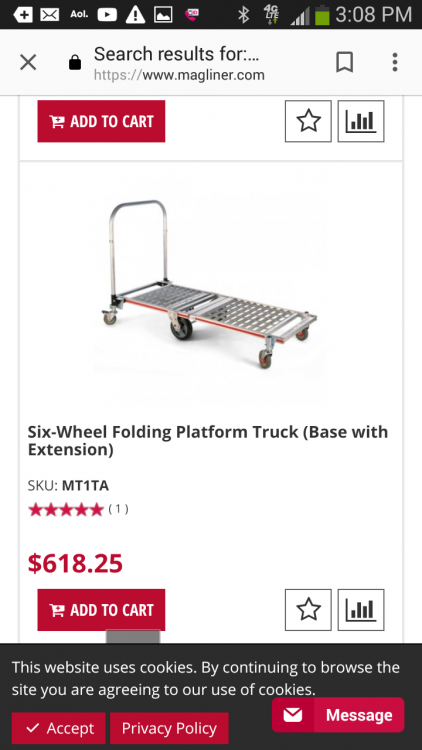 Do you know the approximate weight of the 6 wheel cart you suggested? Anyway, I appreciate your advice and will continue looking for it.